My father was born just one mile down Ripley Hill from the one of the last surviving copper mine headframes in the Copper Range of Michigan’s Upper Peninsula, almost exactly two years after, and only fifteen miles away from, a tragic event called either the “Italian Hall disaster” or the “Calumet Massacre of 1913” depending on your union viewpoint at the time. Seventy-three people, mostly the children of striking immigrant mine workers who were attending a Christmas party, were killed in a stampede while trying to escape from the upstairs of the local Italian Hall after a false report of a fire. 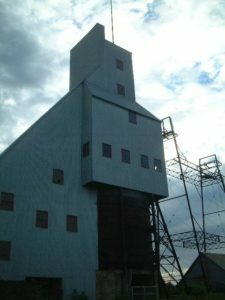 This incident and the Quincy Mine, shown above, both appear in a recent book by Daniel Wolff entitled Grown-Up Anger: The Connected Mysteries of Bob Dylan, Woody Guthrie, and the Calumet Massacre of 1913 (HarperCollins, 2017). This book may appeal to anyone interested in any of its three interwoven threads. The radicalized immigrant mine-worker union movement of the late-nineteenth and early-twentieth century culminated in a miners’ strike that was basically broken by the Italian Hall tragedy, an often-forgotten period in Michigan history. Folksinger-songwriter Woody Guthrie comes into the story a generation later, writing a song called “1913 Massacre” when he was a controversial musical advocate for the pre-WWII labor movement. And still another generation later, Bob Dylan, born 200 miles across Lake Superior from Calumet to one of the few Jewish families on Minnesota’s Iron Range, invents his name and a “Woody Guthrie” persona to break into the folk music scene in New York’s Greenwich Village in the early 1960s. I spent a lot of summers and part of my college years hiking up Ripley Hill above my grandmother’s house. 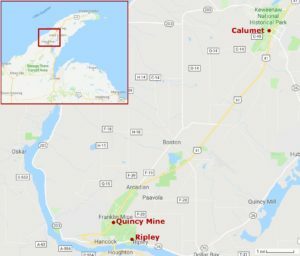 If you made it to the top, you could walk the abandoned train tracks to the Quincy Mine headframe, now part of Keweenaw National Historic Park, which stood atop a 6200-foot-deep, 9200-foot-long shaft into the “native copper” vein. My father’s father (literally my farfar in Swedish), emigrated from Sweden to the Copper Range in 1901 at the age of 19. For most of the next 46 years of his life, he raised his family and worked at the Quincy Smelter on the shore of Portage Lake, just down the street from his home, where the copper-bearing rock from the Quincy and other nearby mines was brought in to extract and refine the pure copper within. The striking miners, parents of the children that died, were mostly from Finland, and in the highly-stratified multi-ethic culture of the Keweenaw Peninsula, they were the most recent immigrants and had the most dangerous of the mine jobs, earning less than one dollar per day. They lived in some of the worst of the company-owned housing, including a community we once visited that my grandmother remembered as being called “Helltown” in those years. Daniel Wolff tracks the evolving influence of the most radical of the labor organizers on the Copper Range, who were often open communists in the era just before the Bolshevik Revolution in Russia. It is hard to put on the shelf the “Red scare” influences under which I grew up in the 1950s to grasp the context of the debate at that time, but the author does a good job in this thread. Capitalism was at its most ugly in those years, with the miners often living in appallingly conditions, indebted to the mine owners, and dying early from disease or mine accidents. The communists offered an alternative vision of equality and hope that that the mine bosses daily denied. The author also deftly tries in this thread to separate history from myth, right down to the widely-varying interpretations of the disaster. Did someone really falsely yell, “Fire!” and was it really an outside union-buster who did it? Were the only exit doors intentionally held shut, as the union alleged, causing the deadly pileup at the doors, or did the doors only swing in, as the mine owners (apparently falsely) alleged? It is a story without a good ending either way. Wolff tells the Guthrie and Dylan story threads in alternating chapters, flipping back and forth to their later timelines, and sometimes the tie between the three threads gets a little thin. But the themes of myth-making and generational anger continue. Woody Guthrie re-invents himself several times during his career, before being hospitalized with Huntington’s Disease just as the McCarthy years in the 1950s shut down the careers of singer-songwriter Pete Seeger, the musical group The Weavers that the two of them had put together, and actor Will Geer (Grandpa Walton in a later-life role), as being suspected communists. Although following a controversial path in the 1950s, today they are all often portrayed today as continuing the labor and human rights movements that were reflected in Woody’s song of the massacre. Seeger and Geer both later re-emerged in the late 1960s as the blacklist was lifted. The Bob Dylan thread walks a much more well-worn path, as Dylan biographies are numerous. Wolff concentrates on Dylan’s first “persona” (well, maybe the second, after his short association with singer Bobby Vee, playing piano under the name of Elston Gunnn, with three n’s). Dylan arrived in New York in the guise of a hobo singer in the style of Woody Guthrie, whom he idolized (and the “hobo” Guthrie persona was, by the way, itself mostly myth). The labor and civil rights movements today face a new set of challenges, ironically often facing nativist “grown-up anger” from my fellow baby boomers, who once marched with Pete Seeger, and who now forget how their own grandparents and great-grandparents struggled for their own place in the American Dream. As for me, I once again live just a couple of miles from US-41, the old north-south U.S. highway that still runs past Quincy Mine, only now I am 1650 miles south on the Florida end of the road. And I still listen to Woody Guthrie’s son Arlo, who maintains both Pete’s and Woody’s traditions in his concerts. He first recorded “1913 Massacre” on his 1972 album “Hobo’s Lullaby” and he still sings it.